Message | Innovation Engine Inc. In the 21st century, Japan is faced with change and also the prospect of innovation on my fronts, and consequently businesses are required to refocus on value creation and its expansion in the context of this changing international business climate. In thinking about these tow objectives, we believe that the following two points must be emphasized. First of all, in the field of value creation each player has to take into account today’s changing business environment and emphasize the inherent advantages for Japanese business in advanced technology fields. Now more than ever we are faced with an era of rapid technical innovation, one that is rapid transforming both products and services. We seek to seize this opportunity and contribute to the development of a “New Industrial Frontier” through the generation of high-tech venture businesses. Second, every business player in today’s changing and competitive field must have a clear vision in mind for their business and take risk positively. Innovation Engine is well-placed to facilitate this. In contrast to the traditional group-dominated corporate culture of Japanese society, Innovation Engine strongly advocates our belief in “value creation resulting from individualism” and stands ready to assist businesses in their pursuit of strong and innovative new business concepts. Innovation Engine was founded with these thoughts in mind to be an engine driving value creation and its expansion in advanced technology fields. 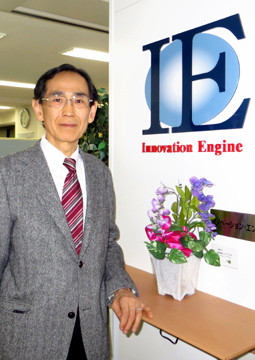 Innovation Engine’s vision is to be the Japanese leader in the venture capital industry in advanced technology areas. We will develop promising venture firms and lead them into the high-technology market which until now only the industrial giants have occupied.